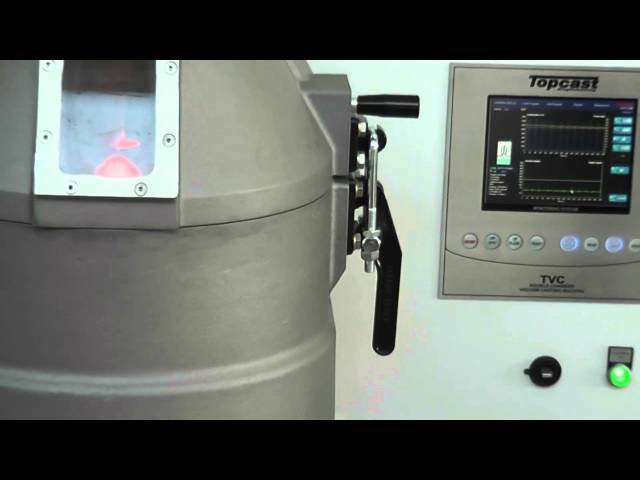 Topcast TVCd-G furnaces are used to produce high quality and homogenous master alloys grains, starting from raw material molten by induction heating in a protective atmosphere, and then poured into a water / alcohol tank passing through a multi-hollowed crucible that acts as flow breaker. The induction generator is designed to allow the homogenization of the alloy thanks to the stirring effect of the magnetic field which works while the metal is being melted in the crucible. Water in the tank is continuously circulating and it is cooled by a powerful chiller to keep the process variables under control and obtaining consistency and quality in the produced grains. The granulator is provided with a heat-exchanger, filters and water pump to separate the process water from the cooling water. After granulation, a two valves interlock system allows for grains recovery while the process water remains in the process chamber. This avoids to transfer the process water to a back-up tank after pouring for then re-transfer back the same to the process tank after filtering the water from the grains. These grains will be finally placed in a resistors heated centrifugal drier to remove humidity. The control logic is provided with a PC based data acquisition system aimed to sample the process variables with reporting function after every casting cycle. Data can be display in graphic format or exported to external PC for analysis. The furnace can be provided with an Oxygen analyser to control and monitor the oxygen content present in the melting chamber during the cycle.